I've recently started playing Pokemon Blue (not pictured), which I have borrowed indefinitely from my friend -- I'm currently at Rock Tunnel. It has made me really nostalgic! I remember very well the routes, the Pokemon, the characters, the plot, everything. 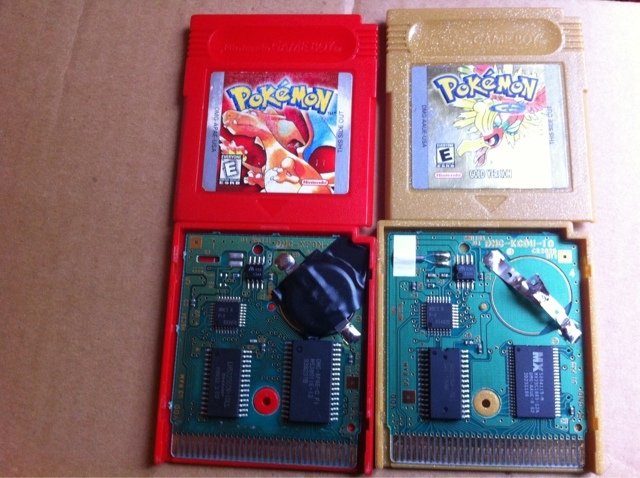 I think starting with my Pokemon Verilog Project from last December, I've been yearning to play the original Pokemon games. Something about not wanting to grow up or about trying to revert back to a simpler time. I think I just want to be the same wide-eyed, blissfully happy, and curious child I was. The child who dared dream of anything. For some reason, I seem to associate Pokemon with that child of the past and that somehow by playing Pokemon again, I can once again become that kid. But I know that's not true. And that living and wanting to live in the past is very dangerous thinking. Anyway, today and yesterday, I set forth to repair my old Pokemon games. These game cartridges are about a decade and a half old. So it makes sense that the internal battery has died. Back then, game data was not stored on non-volatile flash but rather volatile RAM. Volatile memory storage requires a small amount of voltage and amperage to keep the memory in existence. So since the batteries were dead, my Pokemon gamepaks were no longer saving. But it's an easy fix. All one needs to do is use tweezers to unscrew the fancy screw on the back of the cartridge, slide open the cartridge, pry out the old battery, and tape in a new battery. My gamepaks are repaired and I think they will last another 10+ years. I wonder what kind of fancy gaming will exist in the future . . . Will I still want to play the original Pokemon games? Hmmm . . .
Pokemon Red with a new battery taped in with electrical tape and Pokemon Gold with no battery at all.